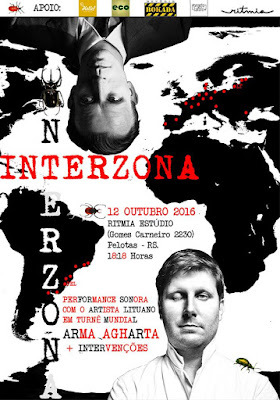 It’s a bit hard to continue reviewing Brazil shows from the European autumn reality, the grey sky and yellow leaves brings melancholy, which is such an opposite thing to Brazil experience. But I’m contrast lover, so ok I will try to concentrate on writing now, because I had a really positive experience in the cities of Florianopolis and Pelotas. I was met at the station by Blu Simon Wasem, the show promoter and the artist and his mother, who is English teacher (as my mother) and reiki healer. From the very first moment I felt that I’m in good hands and when we arrived to the house, which is in a beautiful, calm place, only ten minutes from the ocean, met Milene, his woman, and got totally relaxed. So the show, which was called in the name of famous Lithuanian cold beetroot soup had to happen here in the house. There were three planned acts. 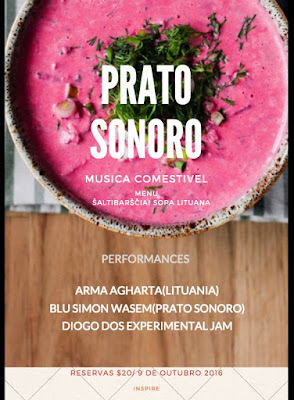 Me, local guy Diogo on guitar and electronics; and Rafael – amplified food by preparing cold beetroot soup. All sounds good. I’m getting a bit out of playing mood, because of relaxation and it’s a bit maybe too quiet and even too intimate to play my usually quite loud and noisy stuff, so I thought this time I would make something different, more quiet. But before me - local guy Diogo. He did improvisation on guitar and pedals and a drum machine. It was clearly felt that he comes from the rock music background and this play was kind of amateur, it felt like he is playing more with himself than with the environment. Then, at one point Rafael went to do the soup, so he began his performance while Diogo was finishing. With the help of contact mics (I guess) he processed sounds of knife through the delay on the computer, so it was minimal in sound, but more than just a food preparation. Even though the taste of the soup wasn’t the usual I get in Lithuania, just because some ingredients, like special milk, you can’t get here in Brazil. But people enjoyed it so as me. Then was my turn to play. I can’t remember that well now what I did, definitely it was the most quiet show of the tour, playing in the candle light, putting more attention towards visual aspects…anyway I think all was good and few people that came (could be more of course! but Sunday evening you never know) got different impressions. The next days with Rafael we did some recordings in a studio, which, I hope, will be released soon. In After that I thought that I wanna do more recording sessions when touring. Wanna record duo, trio, etc with someone, to have different dialogue, not only by speech. Also we went to the beach. There were dunes that looked like in Nida, Lithuania. Saw some little monkeys, big birds, bamboos and some insects. Later also we went to the city center, where I tried sugarcane juice (so delicious! ), checked some seconds hand stuff and religion goods. Bought the first postcard which I had to send to my crowdfunding contributors, but I didn’t manage to do. Shame on me! But promise to do it from Asia. So all the time spent in Florianopolis was so good, made me happy about being in Brazil and was a bit hard to leave. We talked quite a lot with Rafael. He was touring Europe and Asia for 4 years. So he had lot’s of experience to share and he understood my situation. This makes me wanna come back and continue organizing shows in Lithuania, and I promise will do it the next year. The night bus from Florianopolis to Pelotas wasn’t the most comfortable thing, but was the only option. I knew that good people are waiting me there. Even though Pelotas is not the place were experimental music shows are usually happening, but I was lucky to google (yes, to google!) 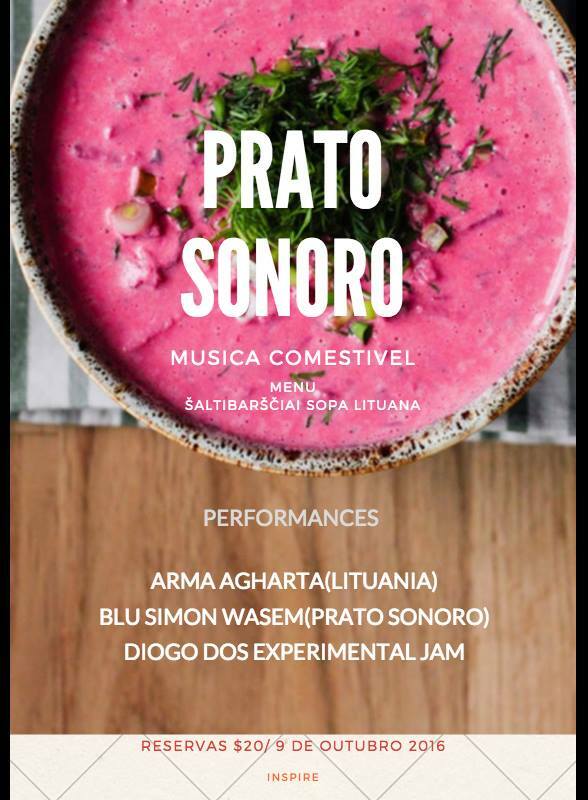 one guy named Gustavo, who is a musician from Pelotas, now based in the US and who introduced me to 4 other people who were willing to organize this show. So, our facebook chat looked promising, seemed like guys were preparing everything in a really responsible way. Upon my arrival, the two organizers, Guilherme and Luca met me and we went to the flat where I could have a rest and additional sleep, so to recover before the show. Pelotas made an impression of Ukraine to me somehow. The city looked a bit poor compared to Sao Paulo and Florianopolis. It was a holiday. So the city was empty, almost like a ghost town. I like it. And I like it when in such a stopped time there is a place where something extraordinary is happening. This event was a mixture of different music and dance performance. All based in a place which looked a bit like house, a bit like garage. Not official venue, but perfect for such a kind of events. I met two other female organizers, Bruna and Pamela. After Brazilian dinner, which was quite a lot of food, interesting mixture of fried potato, rice, beans, meat and salad I had some local sweets. Pelotas is famous for that. On the evening bill there was a local band which plays easy music with ukulele, drums and guitar. After them there was dance performance which I didn’t see much as was preparing for my show in a dressing room. This time, with no regret to myself, I made a powerful, crazy and loud performance. Maybe it was a bit too powerful, I don’t know but I felt like I wanna give all my energy to this evening. Obviously it worked, got some good feedback, one guy, the drummer wanted to do recordings with me later, but he didn’t speak English, so… I know for music it’s not needful, but my stay here in this city was short. So, next time. The next day I saw more of the busy city, checked some second hands, even did a haircut, thanks to Luca for showing me around. In the evening we went to see the lagoon, and finished by eating Brazilian burger called bauru. Perfect. Met so many nice and friendly people. I felt like my part of the soul was left there. I really didn’t wanna leave, but I had to, but I know that I will come back there one day. sorry no photos from these shows... next post - 3 last shows in Brazil, - Porto Alegre, Rio de Janeiro and Cabo Frio.